At Stern & Goldberg Attorneys at Law, we take a human approach to the law. We view our clients as people, not faceless entities - and we tailor our practice to the unique needs of our clients. Established in 1991 by Ellis Stern and Alan N. Goldberg, Stern & Goldberg is a law firm with roots dating back several decades. As an outgrowth of a prior firm founded in 1951, Stern & Goldberg Attorneys at Law is an embodiment of long-standing associations between its partners, many of its clients and much of its staff. 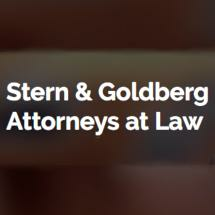 The partners at Stern & Goldberg, in addition to their law degrees, each have advanced legal degrees, are Certified with the California Board of Legal Specialization, and have received a number of honorary designations within the legal community. As such, the firm receives its new clients from satisfied current-client referrals and referrals from other attorneys, accountants and financial planners. All of the above enables Stern & Goldberg to undertake a sophisticated legal practice not otherwise typical with many other firms of its size. Small by design, the firm is dedicated to providing personalized service while maximizing its use of space and personnel. By controlling overhead and streamlining our operations, Stern & Goldberg Attorneys at Law is able to provide quality legal services at reasonable fees. Free from the politics inherent in larger firms, this firm is not burdened by ranks of attorneys who function only to oversee other attorneys and bill the clients accordingly. Our clients are not saddled with charges for costly duplication of efforts. A prompt response to client needs and concerns is another of our fundamental policies. Attorneys at Stern & Goldberg Attorneys at Law complete our clients’ work in a timely manner.